Welcome back to the GNCB, a bi-monthly book club hosted by Geeky Musings from a Nerdy Girl. 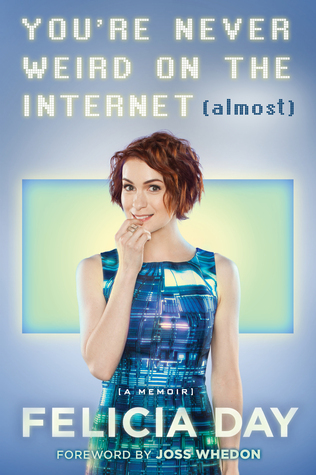 We’re switching it up this month with some nonfiction: the memoir of Felicia Day, geek girl extraordinaire. So, imagine you’re at some fancy Hollywood party. You come upon a cute redhead talking a mile a minute and making everyone laugh. “Well, when I was a kid…” and she launches into her life story for the next five hours. And reading this book is what that conversation would be like. It’s one part fact, one part emotion, and two parts awkward hilarity. Genuine Felicia Day. I’ve been a fan of Day since I first saw her webseries The Guild circa 2008 (in fact one of my first posts on this blog was about her launching Geek and Sundry). From her acting roles and YouTube channel I was able to learn a few things about her, such as that she plays the violin and has a brother. But this book covers so much of her life: her homeschooled childhood, starting her dual math/music major at 16, her struggle to make it in Hollywood, which sort of led to her World of Warcraft gaming, which sort of led to her creation of The Guild, and then even up to relatively current events like her sale of Geek and Sundry and being doxxed as collateral damage in Gamergate. I think the part of the book that impacted me the most was how she talks throughout about her mental health issues. She speaks pretty candidly about the fact that she was actually addicted to WOW and was using it to fill a void in her life. She talks about sitting in the car feeling like she’s going to throw up before a big meeting. Clearly Felicia Day and I are soul sisters, firstly because we have red hair, second because we’re nerds and geeks, and third, because I know exactly what she’s talking about when she describes her anxiety, risk-aversion, obsessiveness, depression, perfectionism, and desire to avoid confrontation at all costs. Yup, it sounds Hallmark-Card-trite, but I’m definitely understanding her meaning that you should let your desires and dreams guide and motivate you. Another thing I related to in this book was Day’s search for her fellow geeks and how the Internet made that possible. I myself have found “my people” on the Internet, just as much as in real life. It started in high school when I was writing fan fiction and interacting with other writers on fanfiction.net. And then to a lesser degree when I started playing SWTOR, the Star Wars MMO (at first I was absolutely paralyzed by the idea of even briefly grouping with any other players I didn’t know; I’m better now). Now my blog is a major source of socialization for me. It’s been a wonderful outlet for my geeky thoughts (which is why I started blogging), and I love being able to talk Star Wars, anime, comics, writing, gaming, etc. with a diverse group of bloggers I follow (which has been a wonderful bonus). PHEW! Ok, this was a long review, but as you can see I really enjoyed the book, and I would highly recommend it (but maybe only if you know who Felicia Day actually is? Don’t confuse her with Emily Blunt, haha). If you want to check out GeekyNerdyGirl’s original book club post, head here. Our next selection will be Leviathan Wakes by James S.A. Corey. I’ve already read this one and loved it (I’m currently in the middle of the 3rd book in the series), so I’m excited to revisit it…and I’m trying to get my husband to read it also. Feel free to join in if you are interested!